Judging by the mock drafts out there, teams finally seem to be catching-on that it's all about (a) the quarterback, (b) hitting the quarterback and (c) protecting the quarterback as the top 20 is loaded with passers, pass rushers and offensive linemen. The difference between the good and bad teams now is down to which ones reach for Blaine Gabbert and Christian Ponder versus which ones wait for Russell Wilson and Colin Kaepernick. Some teams with a recent history of futility have changed coaches and management so I'm going to have to determine whether that will make for better draft day decisions or if those teams suffer from institutional incompetence (the Browns, Jags and Raiders). Last year I used an amalgamation of the mock drafts produced by Mel Kiper and Todd McShay to make the picks and then supplemented the comments with tweets from my people observing adventures at the Rihanna concert. This year I plan to use the same formula but, unfortunately, I haven't taken the FGW to any tweet worthy concerts lately so I'm going to need to manufacture some other type of filler. Let's see where this goes. "Houston is on the clock." 1. Houston Texans - Jadaveon Clowney (DE): It's been twelve years since the Texans did what everyone agreed they should do and take David Carr as the number one overall pick only to see that lead to five consecutive losing seasons and about 732 sacks. Apparently, the Texans are still a bit gun shy because the consensus is that they pass on what are generally considered the two top tier quarterbacks (Johnny Manziel and Blake Bortles) and go with Clowney instead. For their sake, they better be right because if Manziel ends-up being a star, head coach Bill O'Brien and GM Rick Smith are going to be about as popular around town as a vegetarian bull roast (heyooooo . . . don't worry, it gets better). 3. Jacksonville Jaguars - Sammy Watkins (WR): With Manziel gone, the Jags go with the next most exciting player on the board. Watkins is a freak and he may actually help sell a few tickets next year. Some of those ticket buyers might even be Jags fans. 4. St. Louis Rams (via trade from the Browns) - Greg Robinson (OT): The Rams end-up getting their man anyway and solidify the offensive line of arguably the least inspiring offense in the league. I am more convinced than ever that Sam Bradford is either the owner's secret nephew or he stole a VHS tape from Jeff Fisher's house labeled "Moustache Rides!!!" 5. Oakland Raiders - Khalil Mack (LB): The Raiders won't make the move to get Manziel because they've convinced themselves that Matt Schaub is the answer (to the question, "why will the Raiders continue taking on water through at least 2015?"). 6. Atlanta Falcons - Jake Matthews (OT): The Falcons were able to overcome a rash of injuries in 2013 thanks to the leadership of coach Mike Smith and quarterback Matt Ryan. With that kind of solid nucleus, they are just a couple of players like Jake Mathews away from finally winning a playoff game. Wait what? 4-12 are you sure? But I thought Matty Ice was supposed to be . . . um, never mind. 7. Tampa Bay Buccaneers - Aaron Donald (DT): McShay and Kiper have the Bucs taking wide receiver Mike Evans here but they just hired Lovie Smith and I'm wagering that he's either going defense or offensive line with his first pick. Considering that he didn't seem to have any problem watching Jay Cutler get treated like a bad guy in a Steven Segal movie while he was in Chicago, it's probably not going to be an offensive lineman. 8. Minnesota Vikings - Taylor Lewan (OT): The Vikings are another team that just hired a defensive minded head coach and he's going to use his first pick on a project quarterback named Blake Bortles? I don't think so. Let the Blake Bortles Green Room watch begin as we don't get to another team desperate for a quarterback until the start of the second round because teams like the Titans and Cardinals don't realize how desperate they should be. But the bigger issue is the name. Brady, Manning, Brees, Rodgers and "Bortles"? I'm not feeling it. 9. Buffalo Bills - Mike Evans (WR): OK, I'm completely going off the Kiper/McShay rails here but all of the offensive linemen are gone, Evans is the best player available and the Bills number one receiver is Stevie "Oops" Johnson. 10. Detroit Lions - Darqueze Dennard (CB): Both Kiper and McShay go out of their way to explain why the Lions will not pick a cornerback here but I'm not buying it. Especially McShay's theory that "the Lions have used a lot of high picks on defenders recently so they can afford to go with an offensive playmaker here." Their defense is terrible, they need to beat Aaron Rodgers and Jay Cutler to win the division and they already have Calvin Johnson and Reggie Bush for keyreist sake. Take a cornerback you morons. wanting to see Bortles drafted tonight. 11. Tennessee Titans - Blake Bortles (QB): I was fully prepared to let Bortles drop and then I looked at the Titans depth chart and it said: 1. Jake Locker, 2. Charlie Whitehurst and 3. Tyler Wilson. Ken Whisenhunt just watched that movie in Arizona for three years starring John Skelton, Derek Anderson and Kevin Kolb and it was worse than Grown Ups 2. ("We don't have a joke for this scene . . . wait, let's have Shaq break a diving board and then piss in the pool. We can segue to just about anything from that"). 12. New York Giants - Odell Beckham, Jr. (WR): Eli Manning led the league by a mile with 27 interceptions last year so wide receiver seems to be the logical choice. By the way, that's the most picks since Brett Favre had 29 in 2005 but Favre was a "Gunslinger" whereas Eli is more of a "Kid Who is Told to Run and Get the Sheriff" in the wild west analogy department so his interceptions are less excusable. 13. St. Louis Rams - HaHa Clinton-Dix (S): This is about the point where I start running out of things to say as the quality of the teams gets better and the players they're drafting get less familiar so in honor of HaHa, I'm just going to start inserting random Mitch Hedberg** lines where necessary starting with this one: "I want to hang a map of the world in my house and then put pins in all of the places I've traveled . . . but first I'm gonna have to travel to the top two corners of the map so it won't fall down." 14. Chicago Bears - Calvin Pryor (S): I guess now that the Bears have figured-out how to score a whole bunch of points they want to figure-out how to stop other teams from scoring a whole bunch of points and a new safety is a good place to start. Mitch? "I haven't slept for ten days . . . because that would be too long." 15. Pittsburgh Steelers - Zack Martin (OT): As much as I would like to see the pounding of Ben Roethlisberger continue with the Steelers ignoring the offensive line here, I think even they have noticed that that the inebriated women who used to be hanging-on to Ben have been replaced by 300 lb men. (That cheap shot was brought to you by Hines Ward). 16. Dallas Cowboys - C.J. Mosley (LB): The Cowboys defense was as comically bad as Tony Romo's 4th quarter game management. Along those lines, "every book is a children's book . . . if the kid can read." 17. Baltimore Ravens - Eric Ebron (TE): This is the guy the Ravens really want and the Ravens tend to get what they want in the draft. Sometimes it's an Ed Reed and other times it's a Kyle Boller (but more often it's an Ed Reed). 18. New York Jets - Brandin Cooks (WR): When you're pretty confident that you don't have an NFL caliber quarterback on your roster what do you do? Well, if you're the Jets, you go out and sign Chris Johnson and then back that up with a first round wide receiver. NOW LET'S GO EAT A GODDAMN SNACK! 19. Miami Dolphins - Morgan Moses (OT): I seem to remember the Dolphins having some issues along the offensive line last year. And you know what else? "I had a paper route as a kid. I was supposed to go to 2,000 houses . . . or two dumpsters." one you can get yelled at for having." 20. St. Louis Cardinals - Anthony Barr (LB): Kiper has the Cards taking quarterback Derek Carr here but I think Mel's going for an "I told you so" pick that no one will remember when it doesn't play out that way. Oh Mel. You are quite full of shenanigans. 21. Green Bay Packers - Ryan Shazier (LB): When you've got Aaron Rodgers, Eddie Lacy, Jordy Nelson and Randall Cobb, all you need to do is make sure the other team scores less then 24 points so why not load-up on defense? Or, as Mitch Hedberg would say, "I had one anchovy . . . and that's why I didn't have two anchovies." 22. Philadelphia Eagles - Jordan Matthews (WR): I was going to go down an uncomfortable path involving Riley Cooper and DeSean Jackson here but the FGR is more about mocking social issues than tackling them so let's just point-out that "an escalator can never break . . . it can only become stairs." 23. Kansas City Chiefs - Marquis Lee (WR): I'm putting Lee here because that's the consensus but the last time we saw the Chiefs they were getting run over by the Colts in the playoffs to the tune of 45 points so I would think a defensive back might be attractive in this spot but what do I know? I'm just a golf writer. 24. Cincinnati Bengals - Kyle Fuller (CB): Andy Dalton's playoff futility has masked the fact that the Bengals are pretty much loaded at every other position so I speak for the entire AFC North when I say, sign that man. Mitch, what's your take? "My belt holds-up my pants and my pants have belt loops that hold-up the belt. What in the hell is going on down there? Who is the real hero?" 25. San Diego Chargers - Jason Verrett (CB): Don't you get the feeling that no matter what the Chargers do, their destiny is always a disappointing playoff loss? Mitch, anything along those lines? "The depressing thing about tennis is that no matter how good I get, I'll never be as good as a wall." 26. 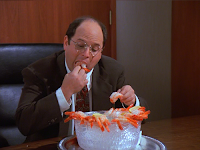 Cleveland Browns - Justin Gilbert (CB): This is the pick the Browns stole, um, I mean received from the Colts for Trent Richardson and is also the first sign that they may be on the verge of a George Costanza landing his dream job type metamorphosis. 27. New Orleans Saints - Cody Latimer (WR): The Saints continue to maintain that Jimmy Graham is not a wide receiver so they don't have to pay him like a wide receiver despite the fact that he led the team in receptions, targets, yardage, yards per catch and touchdowns last year. By drafting Latimer, they can now enhance their argument by saying that Jimmy Graham is so much not a wide receiver that they had to draft a new wide receiver. Makes perfect sense to me. 28. Carolina Panthers - Davante Adams (WR): The Panthers continue to disrespect Steve Smith by first having the audacity not to sign the 34 year old receiver to a lucrative contract and then by drafting his replacement. He is so going to make them pay for that by running his routes extra fast and trying really hard to catch the passes thrown to him when the Panthers come to Baltimore on September 28th. One Guy: "Do we think Matt Schaub has gotten over all of those pick sixes?" Other Guy: "Who cares? We traded him to the Raiders." First Guy: "Oh yeah, well then who's our quarterback now?" Both Guys: "Get Belichik on the phone." And of course the Patriots will trade out of this spot because Bill Belichik can beat your first round picks with his second round picks all day . . . right up until about the third week of January. 30. San Francisco 49ers - Stephon Tuitt (DE): In honor of what has become a very touchy relationship between head coach Jim Harbaugh and general manager Trent Baalke, "I don't have a girlfriend. I just know a girl who would get really mad if she heard me say that." "Get out of the road idiot!" 31. 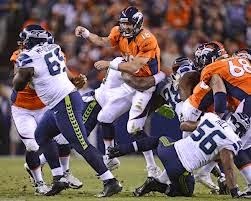 Denver Broncos - Cyrus Kouandjio (T): If you're the Broncos, you have to believe that the Super Bowl was right there for the taking but for the 8 points you scored and the fact that Peyton Manning's day in the pocket reminded me of this one . . . "when I was on acid, I would see things like beams of light and I would hear things that sounded an awful lot like car horns." 32. Seattle Seahawks - Gabe Jackson (G): One last one from Mitch that seems especially appropriate for the Seahawks. "I used to do drugs. I still do, but I used to too." * At this point, you would have to bet that it's going to be business as usual for the Browns who hired head coach Mike Pettine AND THEN admitted that they later pursued an arrangement with the 49ers that would have landed them Jim Harbaugh. Pettine's daughter was clearly on to something when she tweeted the following after his first interview: "he said the interview went well and he's going back for a second! It's the Browns . . but hey, still pretty cool!" (The best part is that I didn't have to make that up). 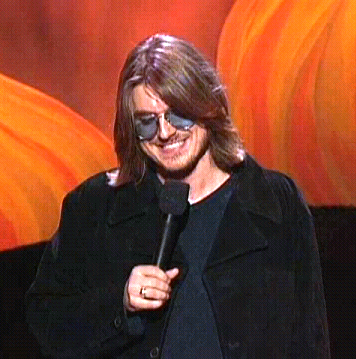 ** If you're not familiar with Mitch Hedberg, he was a comedian who peaked around the turn of the century and then ran into the wrong combo of cocaine and heroin at the age of 37. If you like the jokes, you need to hear them delivered his way. Here is a sample.